I found out about Billy Stewart from watching a conversation between Elton John and Elvis Costello on television. From reading an article in Rolling Stone, I heard about Cornershop. I found some cool Willie Nelson in some interview, but I don’t really remember who or where. Naturally, I don’t recall the first time that I heard The Beatles or The Rolling Stones or Jay and the Americans, for that matter. I have no idea how I stumbled upon Carr only a couple years ago. His heyday was decades ago and he died at least ten years earlier. People have definitely heard of him and keep listening to him. Maybe you have and are just shaking your head right now. The fact is that nothing much has occurred lately to push him into the limelight- this blog post won’t change that, though feel free to rush out and stream or buy one of his recordings. You’ll be glad you did. what led me to the fantastic James Carr. 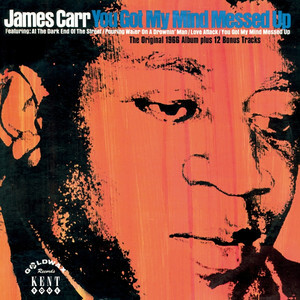 I might have been looking for something in particular by Bobby Womack and one internet recommendation click and there I was: James Carr and his brilliant album, A Man Needs A Woman. Let’s be clear that I am young enough (not by nearly enough) to claim reasonable ignorance about a lot of music, but it is always remarkable to go nosing around in the past and uncover something that just grabs you, especially in popular media. I can cut myself some slack the first time I see a painting in person and realize what I have been missing. There is only one of them and prints and photos may never have done it justice. At the other end of the spectrum, the current profusion of television and film pouring into our household receptacles means that I will probably be constantly surprised by an endless supply of pretty good video. But we are talking about a significant album released during those formative years for me and soul music. Ohhh… but that’s right- this was soul music. Go ahead- give it a listen. I was listening to AOR on the radio- that would be album-oriented rock to those who have forgotten that we actually had a wide variety of music formats coming in over the airwaves before communication corporations discovered how cheap it was to have someone sit and talk instead. Anyway… Otis Redding and Aretha Franklin found their way onto my local radio station, but they had to save room for the Kinks and the Guess Who. That was fine and there is only a certain number of minutes in an hour. So… oh man… just listen. I am so glad that James Carr found a way through his massive challenges to bless us with his artistic contributions. I am doubly glad that fortune gave me a chance to find him now. You’ve Got to Check This Out is a blog series about music, words, and all sorts of artistic matters. It started with an explanation. 212 more to go.